"Food from the Pita Crescent"
Diners can choose from a long list of platters and sandwiches�the former mostly come with pita bread and may include tabbouleh, baba ghanouj, or a roasted half chicken; the sandwiches come loaded with vegetables and, when they include hummus or tzatziki, the portions are generous enough to coat the inside of the bread. The meat in the kafta kebab is rich and spicy, the gyro is a solid choice, and the grape-leaf sandwich is perfectly greasy. For the faint-of-heart, Byblos also offers ham sandwiches, cheeseburgers, and salads, and a tasty but undistinguished piece of baklava is enough to round off any meal. The deli doesn�t serve alcohol, but sodas are cheap and cold, and with efficient service and outdoor tables facing Connecticut Avenue, Byblos is an ideal spot to wile away an afternoon with falafel, coffee, and a newspaper�or to grab a quick bite before a movie at the Uptown. Be sure to check out the back of the menu, which describes the fascinating history of the city of Byblos. 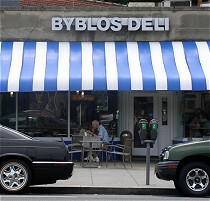 Byblos Deli has been a local favorite in Washington DC's Cleveland Park district for over 10 years. Located next to the famous Uptown Theater, Byblos offers a diverse menu of Mediterranean dishes at affordable prices. 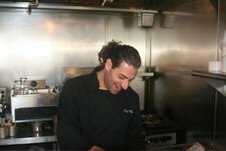 You'll find chef Marc Adas behind the counter at all hours of the day, making the home made dishes he grew up with in Lebanon. For a real treat, try one of Marc's daily specials -- a hearty dish like stuffed peppers or Lebanese meatballs served with rice, a small Greek salad, and pita for only $8.95. Next time you're at the Uptown or the Zoo, or anytime you feel like great Mediterranean food, stop by Byblos!